A series of tropical waves in the eastern Atlantic Ocean may develop into the next tropical depression or tropical storm later this week or this weekend. The first area being monitored has been dubbed Invest 91L by the National Hurricane Center (NHC). The term "invest" is used to identify features that have a chance to develop into a tropical depression or tropical storm. Invest 91L is a poorly-organized area of thunderstorms about half way between the west African coast and the Lesser Antilles. A second disturbed area is immediately to the east of Invest 91L has been dubbed Invest 92L. These two disturbances may have a difficult time getting their act together. Instability for generating thunderstorms between the Lesser Antilles and west Africa is running below average for mid-August. Fresh, dry air known as a Saharan Air Layer (SAL) is pouring in north of both disturbances right now, and may ultimately mix in with the disturbance, preventing thunderstorms from persisting and clustering. Finally, wind shear, the change in wind direction with height, is stronger over and just to the east of the Lesser Antilles, according to an analysis from the University of Wisconsin. This hostile wind shear that rips apart tropical disturbances and weaker tropical cyclones will have to weaken or retreat westward for either of these systems to have a chance to develop. he NHC is also watching another area in the tropical Atlantic for development. Namely, a tropical wave is about to emerge off the west African coast Wednesday, well east of the other disturbances, and then will begin its journey across the eastern Atlantic Ocean. This latest wave may develop by the weekend, but won't near the longitude of the Lesser Antilles until early next week. What form that system takes: tropical wave, depression, storm or hurricane and where it exactly tracks remain unknown at this time. We are in the climatological peak of the hurricane season, so each tropical wave or area of low pressure in the Atlantic Basin must be watched closely for development. 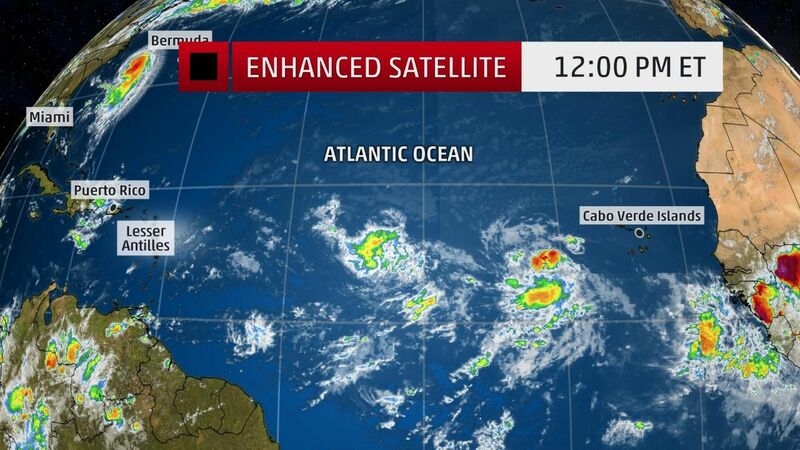 As the image to the right shows, named storms can form in about every part of the Atlantic Basin this time of year. As an example, the disturbance that formed into Gert to the northeast of the Bahamas over the weekend was tracked for nearly 10 days before it finally developed. That tropical wave also originated over Africa. That said, not all tropical waves or low-pressure systems that emerge from Africa become tropical depressions or tropical storms, but they are all monitored closely, particularly when atmospheric conditions are ripe for them to spin up. The next named storm will be called "Harvey."